Dylan Thomas Centre - Swansea - Wales - immaginepoesias JimdoPage! 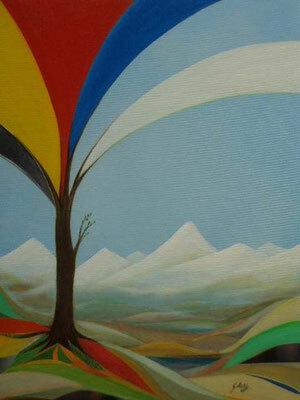 Painting by Italian artist, Gianpiero Actis, called 'Spring'. It is a response to Aeronwy Thomas' poem of that name. Gianpiero and his partner, Lidia Chiarelli, collaborated with Aeronwy. Lidia translated Aeronwy's poems into Italian, and Gianpiero responded to them through art. Gianpiero and Lidia are Charter Members of the artistic literary movement IMMAGINE&POESIA. An exhibition of their poems and paintings was held in the Dylan Thomas Centre in the summer of 2007, and the work was donated to the Dylan Thomas Collection at this time. This framed painting has a certificate of authenticity on the back, signed by Gianpiero Actis, charter member of Immagine & Poesia. 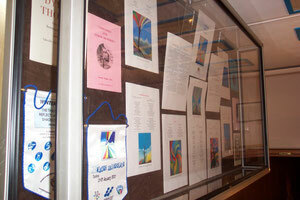 Interpretation Framed poem, 'Spring', by Aeronwy Thomas, printed alongside Italian translation by Lidia Chiarelli. See DTM 880 for artist Gianpiero Actis' response to it, and more information on their collaboration. Donated to the Dylan Thomas Centre by Gianpiero and Lidia in 2007. 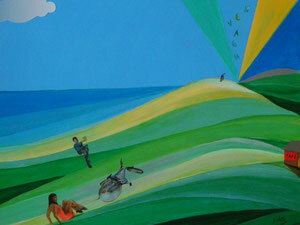 Painting by Italian artist, Gianpiero Actis, called 'Road to Heaven'. It is a response to Aeronwy Thomas' poem of that name. Gianpiero and his partner, Lidia Chiarelli, collaborated with Aeronwy. 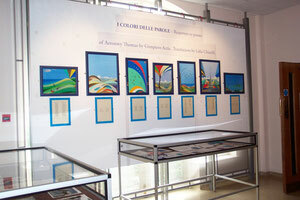 Lidia translated Aeronwy's poems into Italian, and Gianpiero responded to them through art. An exhibition of their poems and paintings was held in the Dylan Thomas Centre in the summer of 2007, and the work was donated to the Dylan Thomas Collection at this time. This framed painting has a certificate of authenticity on the back, signed by Gianpiero Actis, charter member of Immagine & Poesia. Interpretation Framed poem, 'Road to Heaven', by Aeronwy Thomas, printed alongside Italian translation by Lidia Chiarelli. See DTM 888 for artist Gianpiero Actis' response to it, and more information on their collaboration. Donated to the Dylan Thomas Centre by Gianpiero and Lidia in 2007. 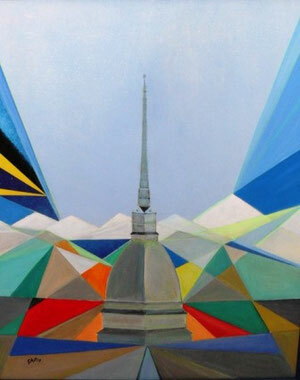 Painting by Italian artist, Gianpiero Actis, called 'A Spire'. It is a response to Aeronwy Thomas' poem of that name. Gianpiero and his partner, Lidia Chiarelli, collaborated with Aeronwy. Lidia translated Aeronwy's poems into Italian, and Gianpiero responded to them through art. An exhibition of their poems and paintings was held in the Dylan Thomas Centre in the summer of 2007, and the work was donated to the Dylan Thomas Collection at this time. This framed painting has a certificate of authenticity on the back, signed by Gianpiero Actis. A comment on the back by Gianpiero Actis implies that the spire may be Torino's. 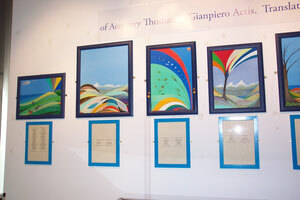 Interpretation Framed poem, 'A Spire', by Aeronwy Thomas, printed alongside Italian translation by Lidia Chiarelli. See DTM 890 for artist Gianpiero Actis' response to it, and more information on their collaboration. Donated to the Dylan Thomas Centre by Gianpiero and Lidia in 2007. 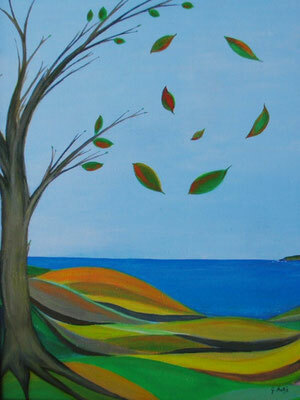 Painting by Italian artist, Gianpiero Actis, called 'Falling Leaves'. It is a response to Aeronwy Thomas' poem of that name. Gianpiero and his partner, Lidia Chiarelli, collaborated with Aeronwy. Lidia translated Aeronwy's poems into Italian, and Gianpiero responded to them through art. An exhibition of their poems and paintings was held in the Dylan Thomas Centre in the summer of 2007, and the work was donated to the Dylan Thomas Collection at this time. This framed painting has a certificate of authenticity on the back, signed by Gianpiero Actis. 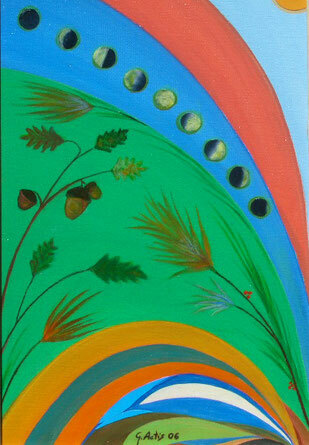 Interpretation Painting by Italian artist, Gianpiero Actis, called 'Richmond Park'. It is a response to Aeronwy Thomas' poem of that name. Gianpiero and his partner, Lidia Chiarelli, collaborated with Aeronwy. 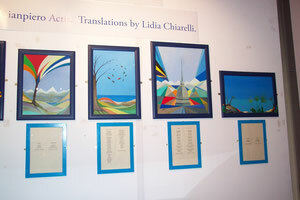 Lidia translated Aeronwy's poems into Italian, and Gianpiero responded to them through art. An exhibition of their poems and paintings was held in the Dylan Thomas Centre in the summer of 2007, and the work was donated to the Dylan Thomas Collection at this time. More work can be viewed here: http://immaginepoesia.blog.lastampa.it/immagine_poesia/ This framed painting has a certificate of authenticity on the back, signed by Gianpiero Actis. Interpretation Framed poem, 'Richmond Park', by Aeronwy Thomas, printed alongside Italian translation by Lidia Chiarelli. See DTM 892 for artist Gianpiero Actis' response to it, and more information on their collaboration. Donated to the Dylan Thomas Centre by Gianpiero and Lidia in 2007. 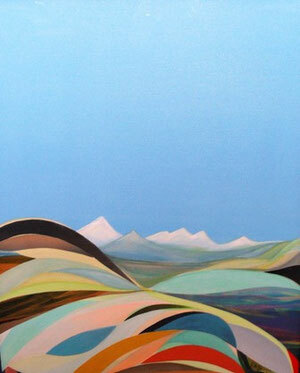 Painting by Italian artist, Gianpiero Actis, called 'Winter Lights'. It is a response to Aeronwy Thomas' poem of that name. Gianpiero and his partner, Lidia Chiarelli, collaborated with Aeronwy. Lidia translated Aeronwy's poems into Italian, and Gianpiero responded to them through art. An exhibition of their poems and paintings was held in the Dylan Thomas Centre in the summer of 2007, and the work was donated to the Dylan Thomas Collection at this time. This framed painting has a certificate of authenticity on the back, signed by Gianpiero Actis. Interpretation Framed poem, 'Winter Lights', by Aeronwy Thomas, printed alongside Italian translation by Lidia Chiarelli. See DTM 886 for artist Gianpiero Actis' response to it, and more information on their collaboration. Donated to the Dylan Thomas Centre by Gianpiero and Lidia in 2007.